"One man goes to war. James Bishop has had a lot of time to think about who set him up. Now he’s determined to settle scores. 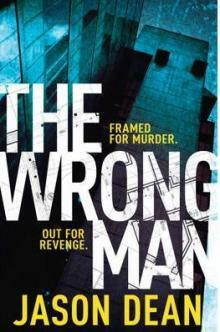 ‘The Wrong Man’ is a roller coaster of a ride with a super-hero at the helm. Doesn’t miss a beat! Bishop has all the right friends at all the right times. Climb aboard, immerse yourself in the chase and be surprised at how it all ends." He’d been with the RoyseCorp security organisation for six years. Enough time to put together a dependable team but not so long that he’d forgotten any of his experience in the Marines. His men all had their shortcomings but none got in the way of doing the job. Framed for the murder of two clients James Bishop had enough time in prison to think about his demise. Framing him had to have been an inside job and he had a score to settle. Escaping took planning, skill and just a bit of luck. Deputy Marshal Angela Delaney is the one in pursuit, and wherever he is she is never far behind. A man on the run needs all the help he can get and there is plenty of that available. The family of his cell mate have talents that are all too useful – and contacts that will prove invaluable in the end. Aleron Falstaff provides a new ID, his sister Jenna can tiptoe through cyberspace. All of which helps to checkout all the possible suspects and tie up loose ends. And tying up is exactly the talent that Danny Costa brings to the party, but you really don’t want to see what comes next. James Bishop had lost thirteen minutes of his life. Not something you can afford to happen when you are on a close protection assignment. Randall Brennan and his daughter Natalie were the ones who needed protection. Threats had been made to the family, which was why RoyseCorp, New York’s finest personal security firm, had been called in. For an ex-marine and his handpicked merry band of men it should have been a routine job. Now, though, James Bishop has been taken down with chloroform and it is anything but routine. In the struggle he had managed to stab his assailant in the arm and got a glimpse of the lower part of his face. Instinctively, as soon as he got his senses back, Bishop had taken out one of the assailants, but his team had been overwhelmed in a fire-fight. Worst of all, both clients had been brutally slaughtered and the secure vault laid wide open. Body count was seven and someone made sure enough physical evidence pointed to Bishop as the perpetrator with the million-dollar motive. No room for any doubt. They'd got him. Prison leaves it’s own mark on a man, particularly an innocent man. His cell-mate needed his help. Owen Falstaff hadn’t asked for it, just that some of the real ‘bad boys’ were going to try it on with him. Not something Bishop could stand back and let happen. Foolishly one of them thought he could take him on… Amazing how much damage an ex-marine can do with a pencil. Then it became Bishop’s turn to be on the end of a beating. The “Three Bears” took pleasure in dishing out contract beatings. Sufficient to put him on the hospital wing and the chance to escape. Drugs, stolen keys and a fake Invoice complete the plan. Then it’s up, up and away. First call? Back home to pick up his hidden ‘starter for ten’ pack – money, clothes and a weapon (as his marine sergeant had said ‘You never know when you might need an untraceable gun.’). Second call? The brother of the man he’d helped in prison. It was his turn to be helped. So there are two problems… First, staying out of the clutches of the law. There hasn’t been a breakout from that prison in twelve years. Now there’s a manhunt – pictures in papers, news on the TV and a determined Deputy Marshall. Second problem? Finding the man who attacked him at the Brennan house. Owen Falstaff’s family turn up trumps. Brother Aleron is a forger of distinction – so that’s false papers sorted. His sister is ‘fit’, fancies Bishop and has skill as a computer programmer. So that gets him to first base. And then there is the question of why he was framed. That’s going to take some dodging around downtown hotels, flying about in helicopters and the discovery of some consequential paperwork at the Brennan house. Slowly, piece-by-piece, the case comes together and the stakes are raised. All Bishop has to do is avoid the attention of a serious killer and someone who loves to torment. Death at their hands will be either fast or furious. The revenge he plans is all the sweeter for that.